Lt. Gen. H.R. McMaster, President Donald Trump's outgoing national security adviser, slammed Russian President Vladimir Putin on Tuesday night, saying Russian aggression was a "grave error" on Putin's part. McMaster spoke at a dinner, which was hosted by the Atlantic Council for the leaders of the three Baltic states, hours after Trump claimed "nobody's been tougher to Russia than Donald Trump." He took a parting shot at the Trump administration, as well as previous administrations, during his last public remarks by saying the United States has "failed to impose sufficient costs" on Russia in response to their "sophisticated" attacks. "Russia employs sophisticated strategies deliberately designed to achieve objectives while falling below the target state’s threshold for a military response. Tactics include infiltrating social media, spreading propaganda, weaponizing information, and using other forms of subversion and espionage," McMaster said. "So for too long some nations have looked the other way in the face of these threats," he said. "Russia brazenly and implausibly denies its actions. And we have failed to impose sufficient costs." While McMaster believes the United States and other nations havn't done enough, he said Putin is "wrong" to believe Russia is winning the new form of warfare that it has been executing around the world. "Russian aggression is strengthening our resolve and our confidence. We might all help Mr. Putin understand his grave error. We might show him the beaches of Normandy, where lingering craters and bullet holes demonstrate the West’s will to sacrifice to preserve our freedom," McMaster said. Later in the speech, he praised Trump for telling the truth about the "murderous regimes and oppressive doctrines," an apparent reference to North Korea and Iran. "The call to compete, to cooperate with others who share our principles, and to catalyze positive change is central to the president’s National Security Strategy. 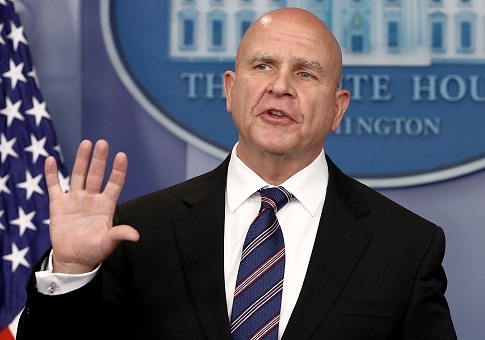 And over the past year, the United States, our allies, and our partners have acted to defend our institutions and our liberty," McMaster said. He also praised Trump for ordering the removal of 60 Russian intelligence officers and the closure of the country's consulate in Seattle last week. "This action will also help protect our democratic institutions and processes, as these Russian officers orchestrate Russia’s sustained campaign of propaganda, disinformation, and political subversion," McMaster said. Former U.S. Ambassador to the United Nations John Bolton will be replacing McMaster effective April 9. This entry was posted in National Security and tagged Donald Trump, H.R. McMaster, John Bolton, Russia, Vladimir Putin. Bookmark the permalink.